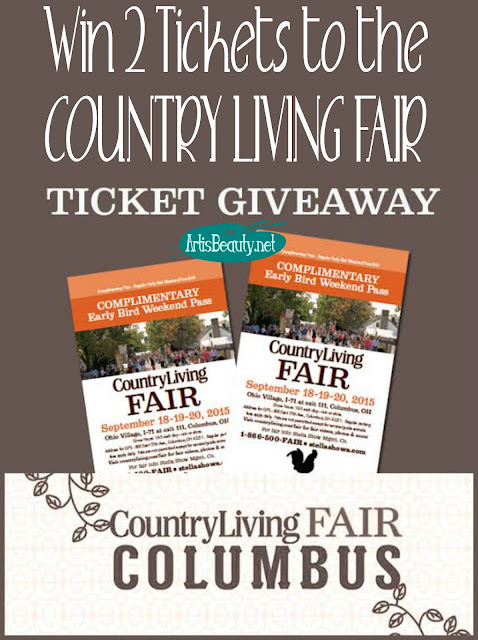 ART IS BEAUTY: COUNTRY LIVING Fair Giveaway! A great big show and sale of antiques, vintage, “Made in America” crafts, art, furniture, home decor, handcrafted clothing and jewelry and so much more. Meet the editors of Country Living Magazine and their guests, attend seminars and how-tos, see artisan demonstrations, shop the Harvest & Gourmet Market, and gather ideas and inspiration. There are great shopping options, with over 200 booths of antiques, vintage, upcycled and hand-crafted goods. Featured vendors include Berries In The Meadow, Caromal Colours, Century Farmhouse Soaps, Earth Angels Studios, Findings@SummerHouse Jewelry, Gathered Comforts, The Great Pumpkin Patch, The Jam & Jelly Lady, Modern June, Rough and Tumble Vintage, RePurpose, Scarlett Scales Antiques, Stash Style, and South Porch Antiques. Additional features include Country Living’s kitchen and main stages with cooking demos and presentations by the editors and their guests, Plus book signings and crafting and how-to demonstrations throughout the fair. Brent Ridge and Josh Kilmer-Purcell, of Cooking Channel’s “The Fabulous Beekman Boys” will make a special appearance at the Fair on Friday, September 18 and discuss style tips from their forthcoming book Beekman 1802 Style. Brent and Josh will also hold a book-signing for Beekman 1802 Style following their discussion on Friday. Additional special guests at the Country Living Fair in Columbus, OH include: Cari Cucksey, star of HGTV’s Cash & Cari, Joanne Palmisano, contributing DIY NETWORK designer, stylist, and many more. Enter below using the Rafflecopter Widget! !